Commenced this morning at 8:10; got to Muir Trial Ranch by 11:30 after a rather steep descent. I could feel the warm humidity of the lower elevation. We opened the gate and went into the ranch. I’d read several times about the protocol here; sit down at the picnic table and the dog will bark, and they will come and find you. Well, basically that’s what happened, although it took a while. A rather elderly woman came and took me to a brick outbuilding which held dozens of five gallon buckets such as the one I’d shipped. I found mine easily enough, signed for it. I gave the woman a couple of rolls of film and some postcards to mail, which she said she would. She was surprised I had my own postcards. Todd and I sat down at the picnic table to delve into my goodies; I had shipped way too much, but I knew that. Regretfully, I left the fifth of rum in the bucket. There was a can of chicken breast meat; and some of the tortillas had gone a bit green around the edges, so at Todd’s suggestion we ate a form of chicken fajitas right then. We also shoveled down as many Oreos and Fig Newtons as we could. I repacked my dehydrated food, my Milkman, and some other things, but realized I couldn’t hold all the Power Bars. I also replenished my homemade jerky supply. Sadly, I left a lot of goodies in the trash. After about a half hour, Tim and Cheryl came in to get their resupply. I forced Oreos and Fig Newtons upon them; they stayed behind as we left. I realized we’d probably never see them again as they had plans to exit the trail in a couple of days. I don’t remember too much about the next couple of miles. I do recall that my pack was now much heavier with ten more days of food stuffed into it. 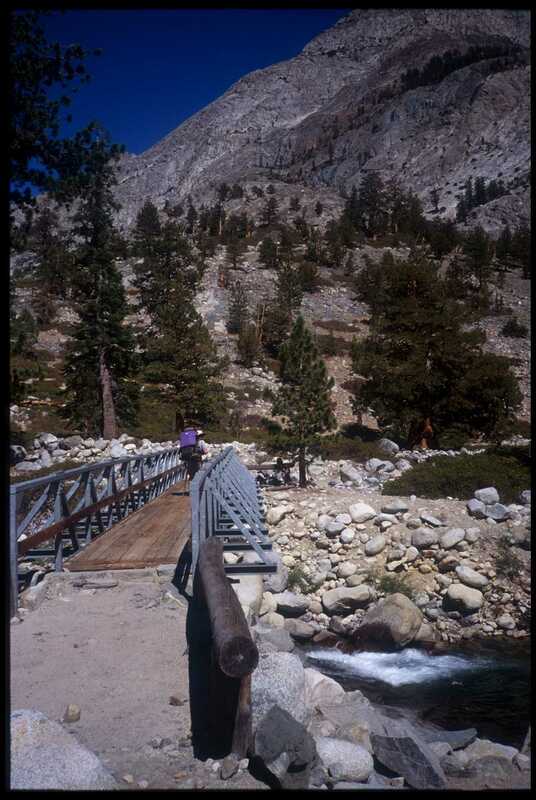 Finally, we got to the backcountry entrance to Kings Canyon National Park, where there was a large bridge over the rushing San Joaquin River (actually Piute Creek). As we took a break there, we met a group coming out of the park. One of them made a comment about the handgun he’d been hiding. Whatever. The rest of the day’s hike was following the trail up the San Joaquin River valley; nice and steady uphill but a bit strenuous because of the additional pack weight (two more photos) . As we crossed the river in Franklin Meadows, a woman stopped there asked me some questions about the trail. As I pulled out my map to indicate to her what I was talking about, she said, “Ooh, a map. We need to get one of those.” I gave her and her male friend some directional advice, wondered to myself how long it would be before they were completely lost, and went on about my business. Later, around 5:15, we’d reached the point where the trail ascended steeply into Evolution Valley. Todd was anxious to see Evolution Valley, as was I, but I was too beat. The additional weight had really taken a toll on me; we camped near the trail. We ended up going 14.8 miles today; started at 7:50 and finished about 6:00 p.m. About a 4,000′ gain according to Todd. The guidebooks indicated a difficult ascent up Bear Valley, but it seemed pretty easy. That rest day did wonders. 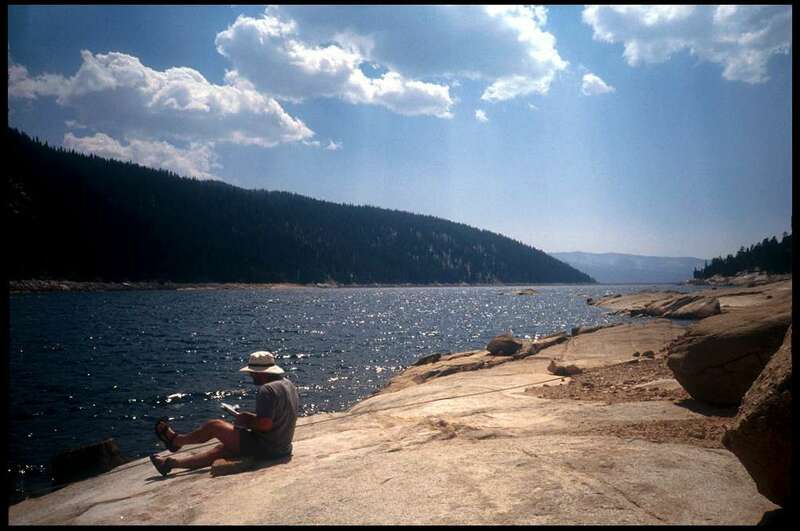 Saw a few hikers and a few fishermen on the trail today, took my last picture of the roll at Selden Pass, and camped at Upper Sallie Keys Lake. Tim and Cheryl had caught us at Selden Pass, and we chatted briefly about the resupply ahead at Muir Trail Ranch. Then they went on; they always did like to hustle on it seemed. I shot the last picture on my roll at the pass. After descending sharply from the pass past Heart Lake, the terrain flattened out for about a mile; I actually went ahead of Todd here, which showed me that we were going maybe a bit too long that day. We went on to the upper Sallie Keyes Lake, a beautiful one of a pair of lakes. We each scouted around a bit to find a comfortable camping spot. I noted several tents on the opposite shore of the lake; one of the few times on the trip I could sense other folks in the vicinity of my camp. As I calculated the day’s distance, I realized how strong I had felt; the day off had done my stamina and/or strength wonders. The ascent out of Vermillion Valley had seemed like nothing. The clear, open sky seemed unusually expansive that night, and I saw a fireball and several meteors before I nodded off. The next morning, I had an excellent breakfast at the cafe. While sipping coffee, planning the next leg of the trip, and reading week-old Fresno newspapers (desperately seeking but with great futility finding little information on college football) I noticed an official U.S. Forest Service vehicle drive up and a uniformed officer talking with several folks on the porch outside. I ignored him for the time being and went back to my coffee. A bit later, I ambled out on the porch and saw a large, hand-lettered sign: “John Muir Trail/PCT Closed.” It went on to say that because of the “Palisade Fire” the section of the JMT beyond Palisade Creek was closed and would be closed through Labor Day weekend and they hoped it would then open, but they couldn’t say. It mentioned alternatives for going through the meadow; all of which were exits from the mountains (Dusy Basin, for example). In other words, not acceptable, nor practical for the through-hiker. Through-hikers were instructed not to continue south. I went back into the cafe to tell Todd about this and we evaluated our options. We even consulted with the cafe employee. Together we decided the most prudent thing to do was to continue on and reevaluate when we reached the fire zone. After all, it would be at least four days until we got to Palisade Creek. We waited for the afternoon ferry, doing various maintenance jobs on our packs, bags, or feet and lolling in the sun in the meantime. We settled our bills; mine was $101, and well worth it. Finally, we got on the ferry (after a half-mile hike: the rapidly receding water line placed the ferry hookup point further out every hour). Jim was off that day, so one of the younger folks tending the business drove the boat. We departed on the same shore we had gotten on the previous day; a crowd of about a dozen was there to get on board. Todd and I hiked up a bit to Quail Meadows, where we made camp. Not a particularly scenic camp; rather claustrophobic, dense forest, obvious signs of previous horse camps around, and several widowmakers looming over us. Also, Todd would have to use his “Ursack” here; the supposedly bear-proof bag. Since he had just resupplied, he had too much food for his cannister and put some surplus in his Ursack and tied it to a tree. The day had seen some clouds; in fact, Jim had early that day remarked that in his experience, the clouds over the mountains would build up a bit higher every day until finally unleashing a thunderstorm, then recede for a while. We had indeed seen them building up a bit every day, but so far no storm. Very strange thing happened last night. Heard some very loud, sharp booms. Explosions. Two around midnight, one a bit later. I first thought it must be lightning/thunder near by, but the sky is completely clear. We were relatively close to several military bases, and the area was well known for nighttime flights of secret aircraft, but I never did find out what caused the nocturnal booms. We got away from camp a bit late; soon passed Tim and Cheryl watering up at the creek. We descended down the trail to the North Fork Mono Creek branch, then followed that on down past the Mono Creek Trail junction toward Lake Edison. A bit before we reached the lake was a sign, with information on the ferry; we found out the morning ferry would stop running in a week; but we’d already missed that day’s morning ferry and would have to wait for the afternoon one at 4:45 p.m. So, we hung out on the rocks along the shore of Edison Lake (and here, and here), whose level we could tell was quite a bit lower than usual. 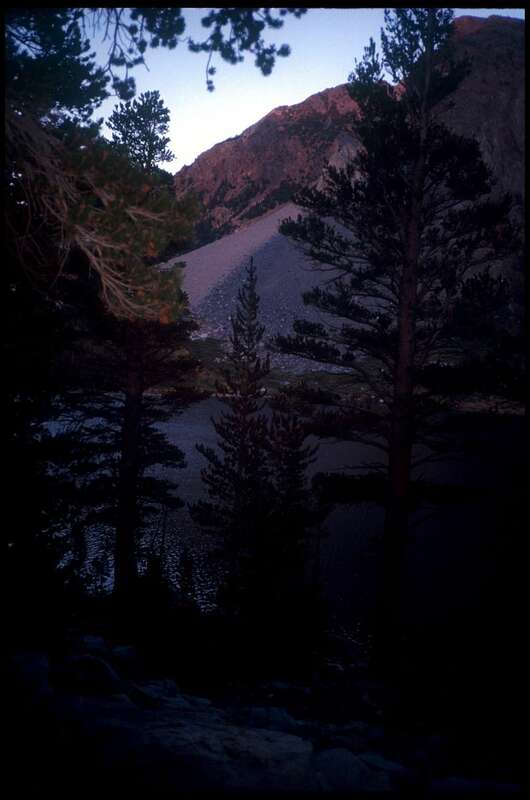 (Edison Lake is an artificial reservoir, with a dam at the other end.) I ate some jerky, some gorp and some Power Bars, read the maps, and ciphered on my GPS for a spell. Simply sitting down with boots off and soaking my dogs in the lake was enjoyable enough. Looking at the other side of the lake I could see a campsite with several tents. I suspected it was a fishing camp, and folks got there via boat. A few more folks joined us at the ferry landing just before departure time. Finally, right on time at 4:45 a small covered flatboat came roaring up to the makeshift landing. About a half-dozen folks with packs got off, including fisherson and fisherdad. Todd and I hopped on the boat (I had read somewhere that one should sit in the back or get soaked), stowed our packs in the center, and sat along the side next to one of the two dogs, apparently the official dogs of Edison Lake. As we rode back in, I talked to the boat driver, who turned out to be Jim, who turned out to be the new owner of Vermillion Valley Resort. I told him we were through-hikers on the JMT, and he picked up his radio and called in, reporting he had six passengers and two through-hikers. I thought that was a good sign. You see, the Vermillion Valley Resort had long had a history of being very popular with PCT and JMT hikers, and actually seemed to encourage their stopping by, as opposed to other stops along the trail which catered mainly to hunters, fishermen and boaters and basically just “allowed” backpackers to use some of their facilities. 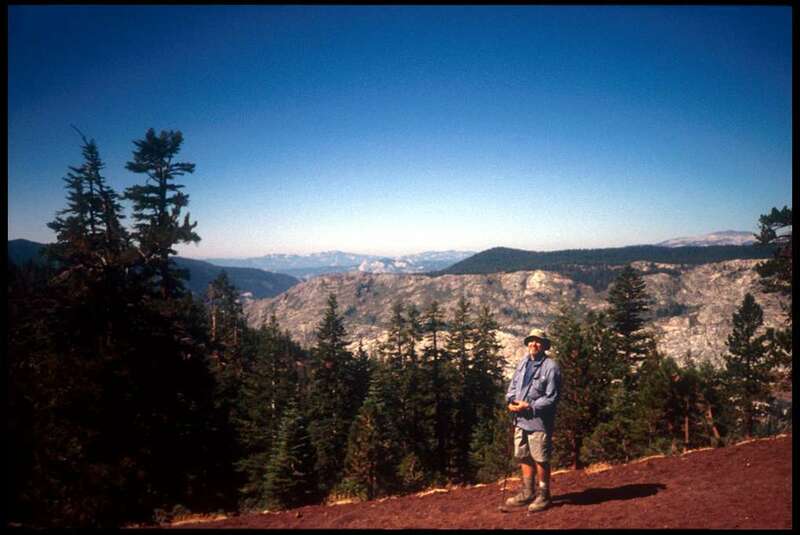 VVR had a tradition of giving the through-hikers a free beer, and putting them up for one night in their tent cabin, and holding resupply packages for a very modest fee. So when Jim radioed back to the resort that he had two through-hikers coming in, I thought that was a good sign. Where we unloaded from the boat was a fair piece from the resort, chiefly because of the low level of the reservoir. A good quarter-mile hike took us past a few of the fancier cabins, some outbuildings, a few mobile homes, and finally to the store/cafe/hq. The woman behind the counter, I believe it was Jim’s wife, gave us the rundown. Basically, we could have anything we wanted from the store, just let them know and they’d write it down (provided you had a credit card, of course). The backpacker’s tent wasn’t yet full, so we could go grab a bed there. And she gave us the ferry departure times for the next morning and afternoon. This was a nice break. I don’t recall what I did first: probably got some chocolate milk and potato chips, then went to the tent cabin to stake out my spot. In the tent cabin I threw my pack on one of the top bunks. Also in the cabin was Bob, a retired firefighter (at 49?) and a couple of teens from his church he was leading on a northbound hike. He had hiked the trail the previous year southbound. Todd had had his mid-trail resupply sent to VVR, and he picked it up and was redistributing his goodies. I then went off to collect on the “free beverage”—in fact, Todd and I split a six pack. I was wary of the dinner at the cafe in light of my experience at Red’s Meadow; I needn’t have been. The steak dinner was superb. As were all my meals at VVR. After dinner I wandered around, checking out the remarkably well stocked store (nearly every emergency replacement item a backpacker could want, including water filter replacements) where I bought a pair of liner socks. One of the kids with Bob had hiked for a few days with a broken hip belt (on a brand new pack! ); he found a suitable replacement fastener at the store. There was a scale out on the front porch; I got on and thought it odd I had gained a couple of pounds. Soon, other fellow hikers tried it out and we quickly realized the scale wasn’t calibrated—or else hiking was making us fatter. There was a trail magic fifty-five gallon drum by the fire ring. In it were items either discarded or left behind by hikers for other hikers to use as they saw fit. The items included a lot of food: I saw several bags of pasta and rice. I wondered if they had proved to be too much, or just that the bearer had thought a diet of pasta and rice sounded good in the planning stage, but after ten or twenty days just decided to toss the whole lot. There was also a pretty decent wind/rain jacket, with a tear. And also a teddy bear, with a note; something to the effect of “Hi, my name is Pookie; I’m hiking the whole Pacific Crest Trail. Please take me with you so I can finish my hike.” I elected not to. Later on, after sunset, most of the folks there gravitated to the fire pit in front of the store. We all traded trail stories, (except for those folks who were there as fishing guests) and took turns going into the store to buy rounds of beers (“put it on my tab, please”). Most of the stories revolved around the other hikers we had seen, particularly those who had appeared nowhere near up to the task. 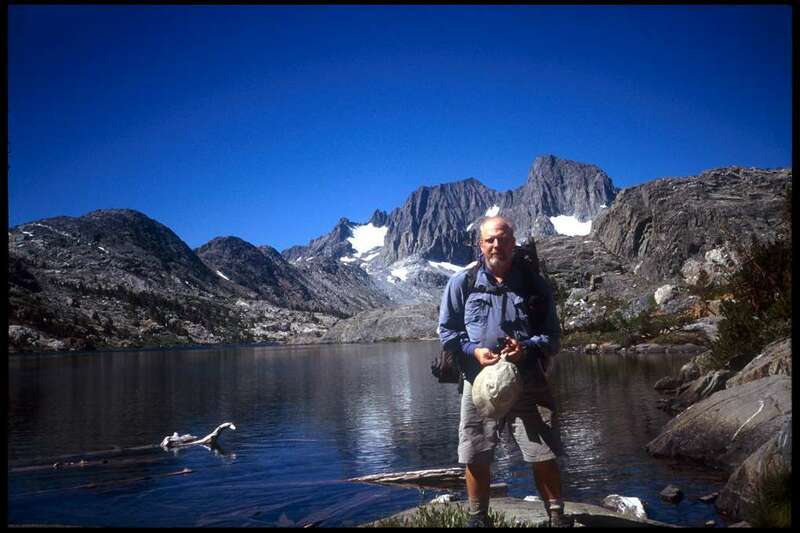 Bob told of a guy hiking up Whitney summit with just a tiny water bottle and street shoes, and that got someone else talking about some other crazy hiker he’d seen, and several increasingly bizarre stories followed. It was all very enjoyable. I really wish I had taken some pictures there, but I don’t think I could have captured the esprit d’ corps, the zeitgeist, or whatever foreign phrase there is to express the comfortable energy we all shared there. Left Purple Lake (and here, and here) around 8:10 a.m. On the way out, passing another tent, a young man out in front of his tent was barely awake. He asksed if I had seen the bear last night. No, I told him. “It was the coolest thing I ever saw. I can’t believe you didn’t see it; it walked right by your sleeping bag.” So there was another bear experience, but one I missed. 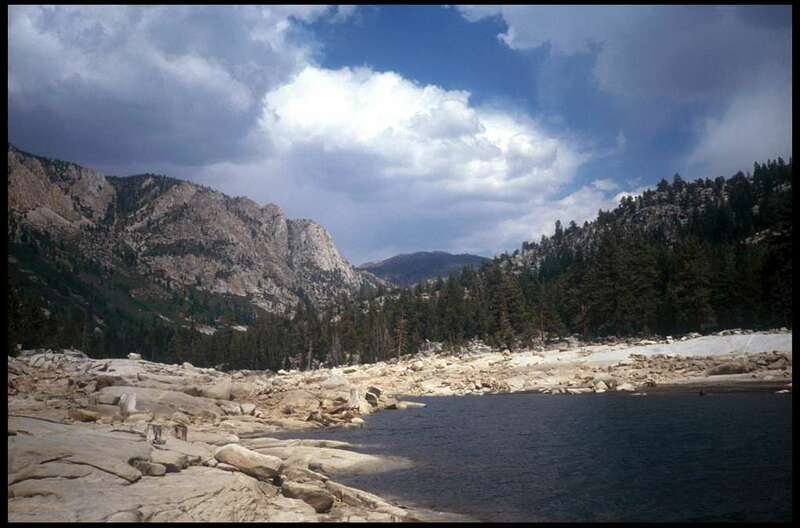 The trail ascended to yet another pass, then descended to Lake Virginia, at 10,338′. This was pretty standard fare; ascend to a pass, descend to a lake or valley, ascend again. 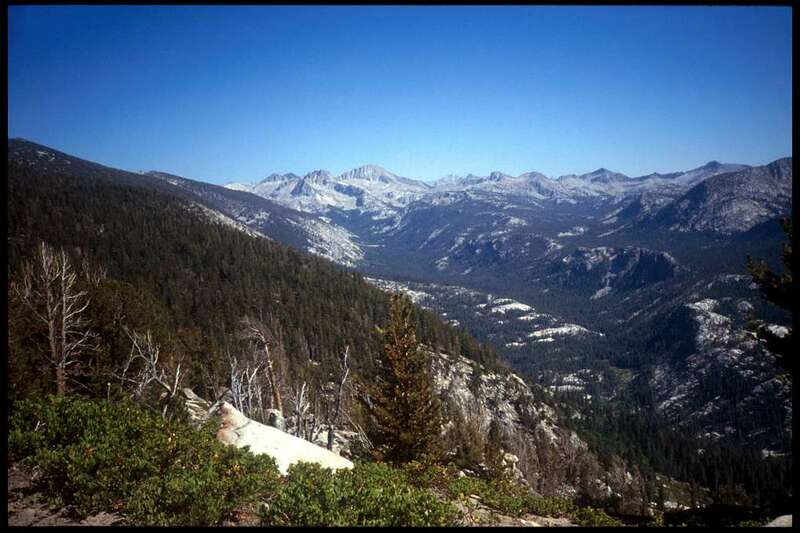 The entire JMT is a series of ascents and descents; a couple of miles of level hiking is a rare thing indeed, and one must learn, as I was learning at this time, that you either accept this fact or go crazy. Lake Virginia was beautiful (it took us an hour and a half), and a very large area, too. Seemed to be much good camping around there if necessary. We came upon an older couple there who were taking an extended weekend backpack trip in the area. Chatted for a while. Left Lake Virginia, had a brief ascent, then could see Tully Hole way, way down below. A very long, hard haul down to there; and my feet were starting to hurt. I recall seeing coming up the trail a man who looked almost ghostlike. I don’t remember the details, just that he seemed to be in a daze as he trudged up the trail. We made it all the way down, then to a trail junction by (I think) Fish Creek. It was actually pretty warm here, and we stopped for a breather and to filter water. 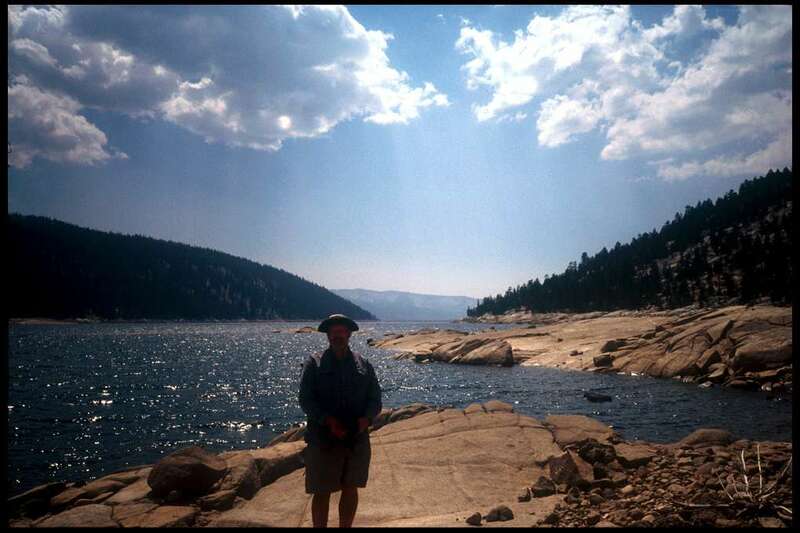 I also recall dreading the next ascent, up to Squaw Lake. Which was long and rather steep, rather tough. Then from there to Silver Pass, which wasn’t so bad. Ran into Tim and Cheryl again around here. While at the top of Silver Pass I noticed clouds; perhaps rain in the near future? After Silver Pass, there was a rare section of trail which was quite level, but even there my feet are complaining some. And then below that, where camping is marked “good” on the map, there was little water. We finally chose a camping spot, near a creek which was little more than a seep. The location was nice; a valley just at timberline. At bedtime, I got my super lightweight tarp out and practiced setting it up; just in case. That day we’d hiked 11.6 miles. Breakfast at Red’s Meadow Cafe around 7:00 a.m. was not bad; much better than the steak the previous night. At breakfast, Todd came in and we chatted a bit. After breakfast, we decided to find the trail head together, sometime around 8:00. It’s actually a bit difficult to find there, as there are many trails and roads winding around the area.We finally did find the trail head, and started the next southbound leg of the journey. Somewhere around here Tim and Cheryl passed us (or we passed them—I forget). The trail climbed almost immediately, which was no problem, but a puzzling and somewhat troubling thing was the fact that my GPS indicated we were traveling due north, which didn’t make much sense. This puzzling trend continued for a few hours, interrupted by occasional switchbacks to the South. More interesting was the scenery, which consisted of the aftermath of an obviously severe forest fire. I recalled having seen pictures on the wall in Red’s Meadow Cafe of a severe fire in 1993 that ravaged the area—obviously this was a remnant of that. 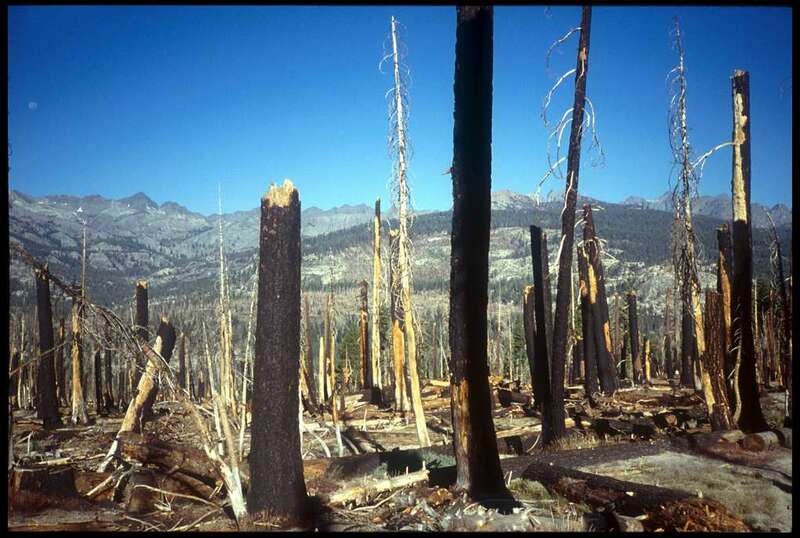 Every single tree had been burned; and the ground was still a deep layer of ash, even after all these years. As predicted, we soon reached Red Cones, fairly recent volcanic cones. Nearby was a signed trail junction, and I knew where we were again. After climbing on a cone and snapping some pictures, we continued on down toward a nearby meadow (where a man and woman on horseback asked us for directions), then over to finally join the JMT proper and take a break and get water at Upper Crater Meadows (11:50 a.m.). After lunch, Todd decided to push on a bit more quickly than I was ready for, and we parted ways. The trail descended for quite some time here, going down to Deer Creek, where I got water and took a break. Not long after that, Todd came up the trail going the opposite way, concerned he may have taken a wrong turn, so we hiked together the rest of the way. Much of the next several miles was a long uphill trek, completely exposed to the sun, and rather warm. Also, Todd tended to hike just a bit faster than I did, so I was a bit gassed and my dogs were starting to bark again. We crossed Duck Creek, a potential campsite, at 5:00, but kept on going, the goal being Purple Lake. The ascent became even steeper, and my feet really began to complain, and I fell further behind Todd. Finally, we reached the cutoff to Purple Lake, although it turned out yet another decent hike to actually reach the lake. And then, when we finally got there, it turned out to be one of the few crowded areas; camping was prohibited along some shores of the lake, and the few decent sites left were taken. We took one which was a flat spot of ground nestled between many granite boulders; actually a pretty typical Sierra Nevada campsite. Except there were at least three other tents within view. The lake itself was nice. And here’s a view from my campsite. Left Rosalie Lake around 8:00 a.m. After a slight ascent, the trail was all downhill to Red’s Meadow. Very dusty. In fact, dusty in a choking, sticky messy way. 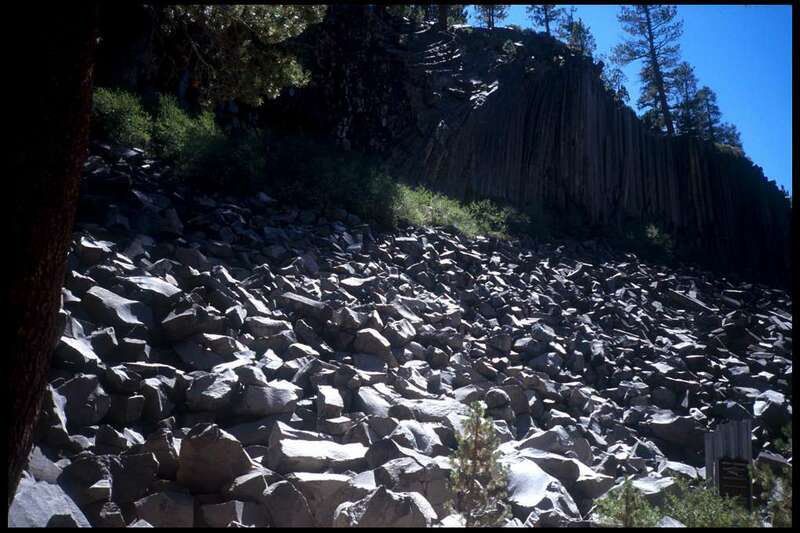 But anyway, I reached Devil’s Postpile National Monument at around 11:15 a.m. A ranger was giving a talk on the trail right at the postpile as I walked up. I felt a little conspicuous, as the crowd was obviously mostly folks who had driven in. (I later found out that very day was “National Park Day.”) I tried to snap a picture of the marten the ranger was pointing at as I arrived. I self-conciously felt the crowd regarding me as the old stinky, dirty, mountain man type as I walked by the families with kids spilling ice cream over their t-shirts. I left the ranger talk behind, walked around the postpile for a while (an interesting site), then found the way to Red’s Meadow, the main campground there. There are few instructions on how to get to the campground if you approach from the backcountry side as I did, but I finally found the campground and the backpacker’s campground within it. The backpackers’ site was empty, so I staked out a place, reserved it, and found my way to the natural hot spring showers, about a hundred yards up the road. Now,those who are used to city-fied showers and such may turn their noses up, but these half-dozen closets, each with a simple tap and overhead outlet, are each sublime to those of us who come out of the backcountry. The water is not only hot, but almost too hot. It was excellent. I came out of the shower and went back to my campsite practically oblivious to anything for an hour or so. After a rest, I set up my primitive campsite (sleeping bag and bivy sack) and began working my way over to the store and cafe. As I walked down the paved road from the campground, I saw a man hiking up the road; obviously a backpacker. He stopped to look at the campground map, and I pointed the backpacker’s campsite and hot spring showers out to him. I finally found my way to the store, and bought the usual chocolate milk and potato chips. Next, I went to the cafe next door and had an excellent cheeseburger. I called my folks and left them a message indicating my survival up to this point, and I also did some laundry in a washing machine there. Before heading back to the campsite I “reserved” a steak for the evening meal. Back at the campsite I met Todd (the guy walking in when I was leaving) and a couple, Tim and Cheryl who had already set up their campsite. We talked a while, swapped stories and shared advice. Tim came back from the store with a full can of Coleman fuel he couldn’t use, so we split that among ourselves. A bit later, we ate supper back at the cafe. The steak was very bad. Most disappointing. Afterwards, as we were sitting on stumps between the cafe and the store, a horse pack train passed us coming in from the backcountry. Tim mentioned quite loudly and humorously that perhaps the wrangler ought to count his horses in light of the toughness of the “steak” we had just consumed. Back at camp, another pair had set up. Actually, as there were only three sites available we had to share, but it was no big deal. 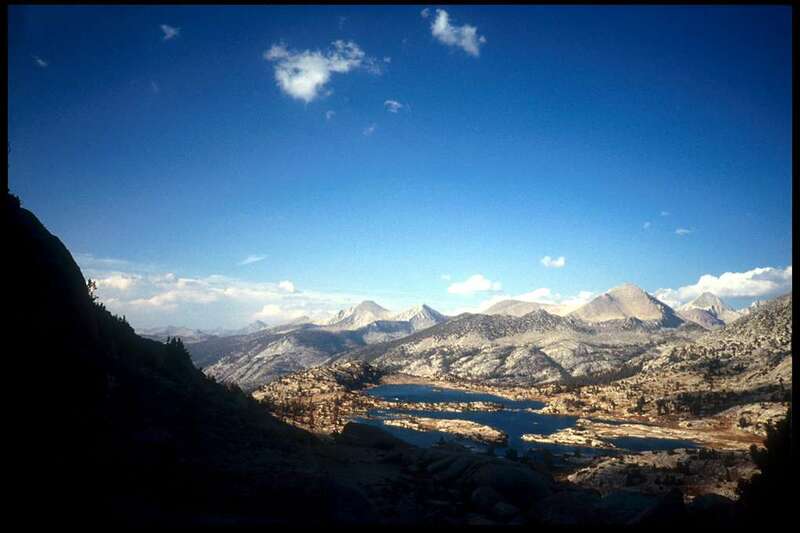 Dan and Dale were doing the Sierra High Route, a route roughly parallel to the JMT but off-trail and even higher in the mountains. We all had a few beers as it got dark, and shared stories and complaints. Although I was feeling pretty strong generally, my feet had been fairly well chewed up, and the half day off would do them a world of good. I fell asleep trying to ignore the cacophony of car campers with families that I had thankfully not been around for a week. I had figured it would be 14.9 miles if I wanted to make Red’s Meadow today, and I really knew I wouldn’t make it. So I had spent a good deal of time with the guide book and map figuring out potential campsites without significant bear problems. The series of high alpine lakes I was about to travel through had a reputation of being popular with both humans and bears. 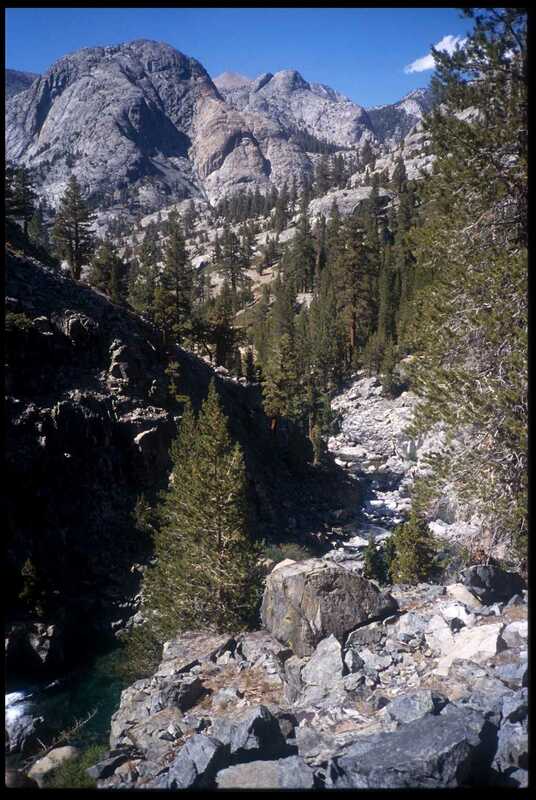 I was still somewhat naive regarding the Sierra Nevada, but soon learned that the proximity to campgrounds and trail heads around Mammoth led to huge numbers of people, and the other megafauna associated with people—horses, bears, etc.. Anyway, I didn’t see anybody on the trail for the first few hours, but when I began to approach Thousand Island Lake, I began to run into people. But to be perfectly honest with you, I’m not sure I recall correctly the stretch of the trail around Thousand Island Lake. I don’t recollect properly (even with photographic assistance) details of that stretch of the trail. I do recall a couple camping near there, illegally close to the trail, with a dog, a barking dog. He lunges, but I survive. 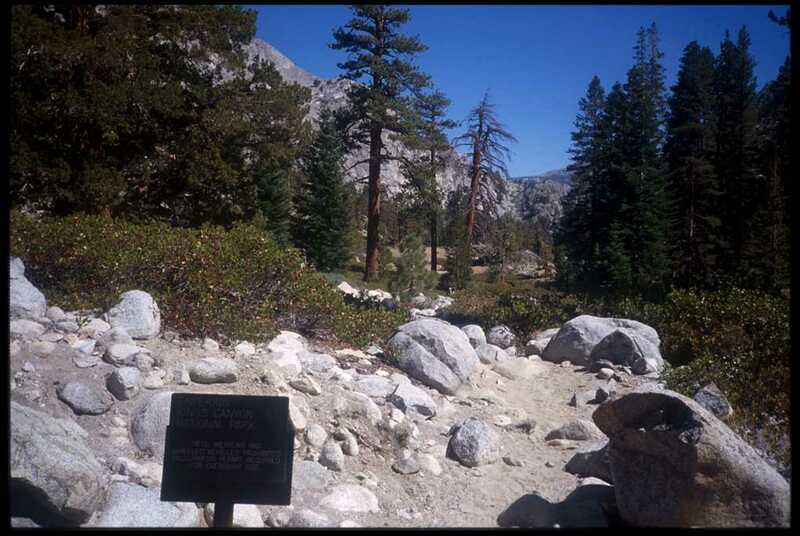 Next, I’m winding my way down toward Garnet Lake. I wend around the north side, then get to the bridge. I stop there to refill my water, amongst the deadwood, and as I’m doing so some chattering hikers (looked like an extended family) come up and insist on my taking a picture of them, so I insist on them taking a picture of me. Ascending from Garnet Lake, I felt a bit of stomach distress; I worried it might be the start of something more sinister, but it would never bother me again on the trip. 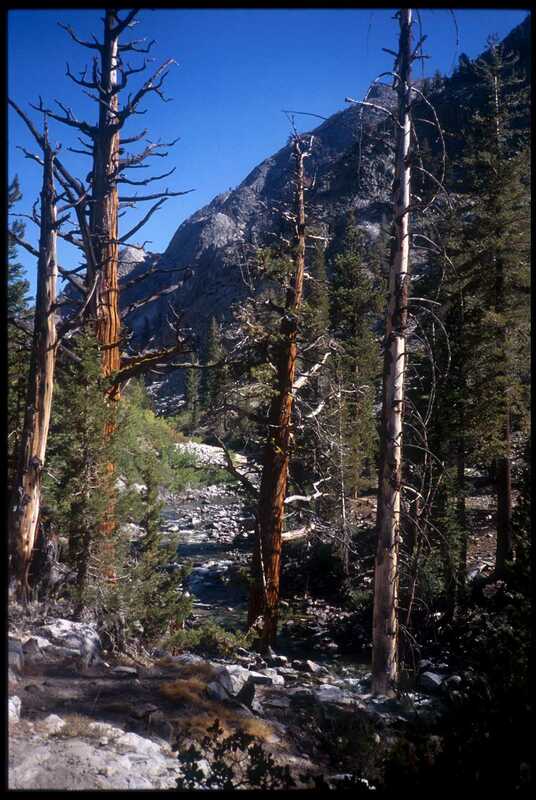 The trail ascends to an unnamed pass, then descends fairly steeply into the Shadow Creek drainage. It seems pretty steep to me, and especially full of loose and unstable rock. It seems as though this descent goes on and on forever, passing through timberline, then into a dry and dusty trail in the woods. It also seems to get pretty warm, and I’m working up a sweat. The lower I go, the dustier the trail gets, and I began to run into more and more people, including a pack train or two. I realize I’m getting close to Agnew Meadows, a popular summertime camping area complete with horse corrals, and it is in fact a weekend, so the crowds should not be unexpected. Still, I get a bit concerned over the number of folks on the trail (for no good reason, as it turns out). Well, I awoke having not been eaten by a bear, or a marmot. After breakfast I had a bit of a time finding the trail again; had to bushwhack a bit and find a good fallen tree on which to cross the stream. It was about 8:00 before I finally reached the trail proper. 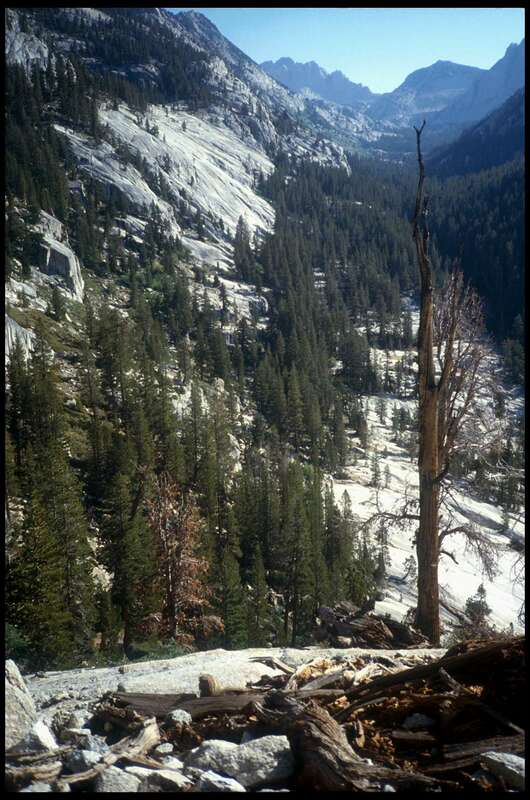 Today would be my first substantial climb since day one, as I would be achieving Donahue Pass (11,056′). 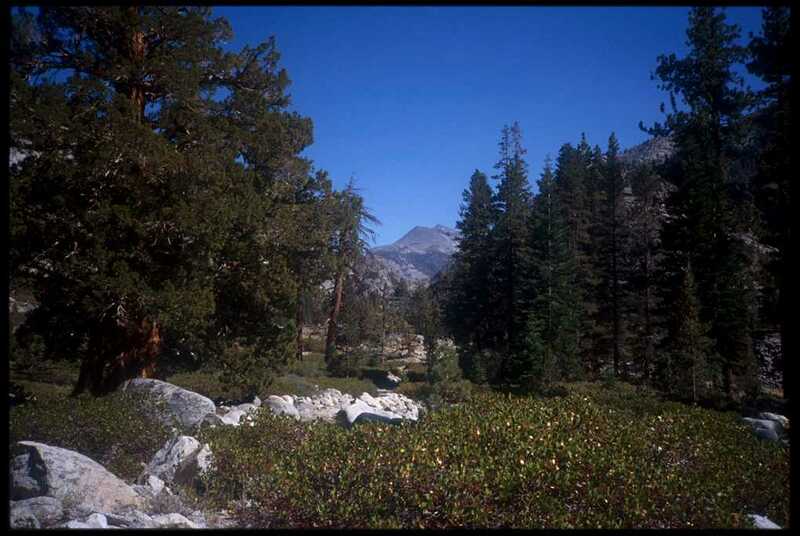 Since I had camped at the very end of the meadow, the trail immediately began to climb. I noticed along the way a few good campsites, and half-wished I had gone further the previous day. At one spot there was a very nice area by a stream crossing, and I filtered water and took a break. I was passed by a few people along the trail, including the young man I had seen camping near me. We chatted a bit; he said he was only up for the weekend and was hiking through to Red’s Meadow. We both chuckled at the scarcity of the famous Lyell Canyon marauding bears. This was probably the first time I’d driven to El Paso since they’d increased the speed limits; I was surprised to find even though I had left late (around noon) I still got plenty of miles in that day. I spent the night in Las Cruces, New Mexico. The next day I made a logistical mistake; owing to my dislike of Interstate driving (with a capital “I”) I tried a shortcut from southwestern New Mexico to eastern Arizona. It *looked* like a shortcut on the map, but ended up going pretty slowly, so I probably lost some time there. I made it to Boulder Dam by sunset, after a brief security check to make sure I wasn’t going to blow it up. It was the first time I’d been there since I was a kid in the 1960’s, and it actually looks pretty cool—a monument to 1930’s WPA engineering and retro design. Anyway, I spent that night in a motel in Vegas-didn’t feel like gambling, so I was pretty out of place there. Left early the next morning, past Nellis AFB and bombing range, and then across Death Valley. I had last visited there in 1986 when it was a mere “National Monument”. I had enjoyed that time there, but that had been in October, with highs in the 90s. Average Death Valley high temperatures are around 115 degree in August, and when I passed through they had been experiencing unusually hot days, even for them, with highs over 120 degrees. Driving through at 9:00 a.m. I didn’t need a thermometer to tell me the temperature was already well over 100 degrees. After a few hours, I was on 395 heading up the east side of the Sierra Nevada. 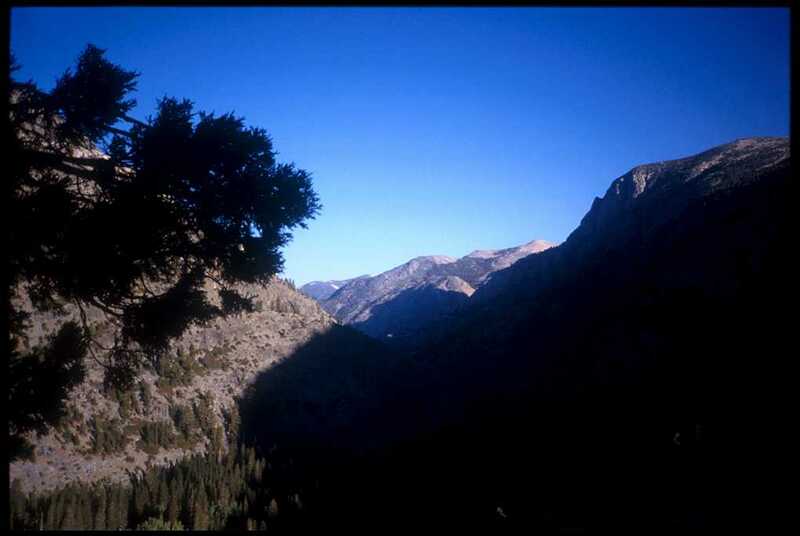 I took a quick detour at Lone Pine to the Whitney Portal trail head and parking area, so I’d know what to expect and not have any unexpected surprises. It was actually pretty well packed, and I made a note of where the “overflow” parking was. We got up the next morning and drove to Yosemite, stopping at a gas station/grill at the turnoff near Mono Lake for a pretty good cheeseburger.Got to the Crane Flat campground, where I’d already reserved a camping spot, later that afternoon. I spent the evening sorting out my gear and food, and we ran down to some bear boxes at Tuolumne Meadows to stash some stuff I wouldn’t need for the first two days of the trip.